As those running Natty have undoubtedly noticed (and it has been noted on the Ayatana mailing list), we currently have a stop-gap measure (until we get connman and indicator-network magic!) for an indicator for network connections being nm-applet with a big ugly patch to make it work as an indicator. In light of the discussion I'm referring to above, as well as a number of bugs that have been reported against network-manager-applet, I've been working on fixing these issues, including making the animations work again, re-adding icons for wireless signal strength and fixing the icons when connected to VPNs. Now, there is still a number of things that need to be fixed in the indicator patch and in the look and feel of nm-applet as an indicator. While this is still meant to remain a bridge until we can switch to connman and indicator-network, I'm looking forward to getting new ideas and to know about the issues you see in nm-applet's look right now. Jump in on the ayatana list and give us your thoughts! I'm interested to hear the reasons behind the switch to connmann. 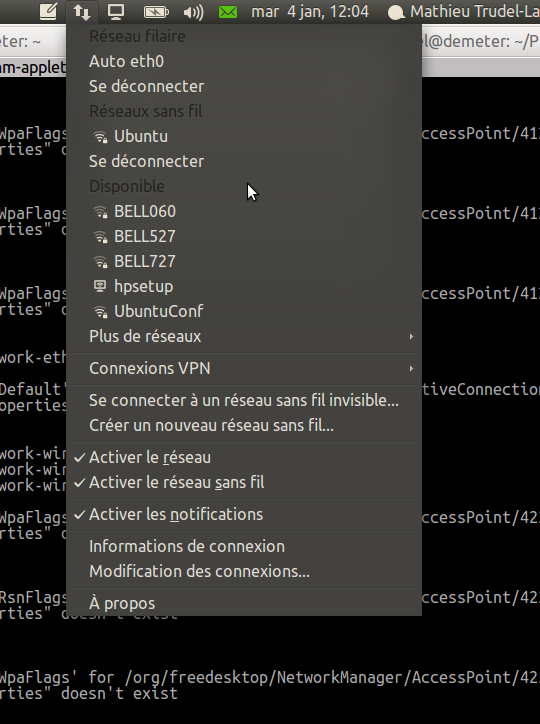 From my experience with meego, connman is missing lots of the functionality present in network manager (no bluetooth tethering, 3g, ad-hoc networks or enterprise wireless security support). It seems there's a lot of work required before connman has the same extensive support already present in network manager. Is there somewhere I can read about ubuntu's plans for the switch? There's a couple of things to consider. For starters, connman isn't going to be the default for natty, which already gives it a few more months to add new features that we may be considering to be critical. ConnMan has a thriving community behind it, and Kalle Valo is doing a great job at fixing things, adding in new features and generally making the indicator-network rock. It's already quite usable, despite whatever may be missing. I think ConnMan developers are very much aware of what's missing, it's just a matter of time and priorities, but things are getting added very fast (just check the release notices on connman.net). As for plans, what you usually want to look at are blueprints coming out of UDS. At this point, we're still aiming to switch to ConnMan and indicator-network, but post-Natty. There'd usually also discussion related to such changes on the ubuntu-devel mailing list prior to UDS. I believe Mark has covered the subject a number of times in interviews as well (sorry, I don't have links). Another resource for you is https://wiki.ubuntu.com/ConnMan which is a great starting point to try out indicator-network and know about the global idea of using ConnMan. I wish I could point you to better links, but I can't for now. I'm very much aware of the missing features but we also need to keep in mind that without more exposure to users, ConnMan won't improve, though we don't want to to have the Ubuntu experience regress in features that are frequently used. NetworkManager will still be installable after the initial setup for those with further needs that ConnMan can't deal with. I think enterprise wireless and VPNs are probably the most important of the features missing (or partially implemented) in ConnMan, but it's just a matter of time, and my guess on what's most used. Thanks for the links and in-depth reply. It looks like at least one of the items on my list (tethering) is being addressed in recent releases, so that's a relief! All my experiences with connman relate to trying to connect a netbook running meego to the internet while at uni. I was unable to connect to the uni-provided wifi, since connman had no support for the PAP authentication required. 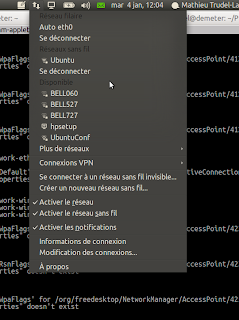 I couldn't tether my phone via bluetooth (my normal connection for when my phone has a decent charge), or connect my phone via usb to act as a 3g modem (my backup when my phone is nearly flat) -- both of these methods work fine under ubuntu 10.10. My final attempt was running software to create a wifi network from my phone, but again, couldn't connect from meego because it wouldn't support ad-hoc networks. Fortunately this was only happening under meego (which i was just playing around with for fun), but if I'd hit the same obstacles while using my standard Ubuntu installation I'd be totally stuck. The menu is too long and really confusing. Please, respond to the thread I started on ayatana. It's doing to be much easier to discuss such things there than on a blog post.